Ok, so this is a couple of days past my actual 16 week, or 4 months, mark (which was last Sunday) but its the best I can do since I've been so sick. I'm going to try to post some belly-pics plus an update at the beginning of each month from here till the baby comes in March. At 16 weeks, I'm feeling really pretty good, at least I was before this cold hit. My morning sickness is gone, and I've had more energy. The best part of the last few weeks is that I've been feeling the baby move. Its been mainly little flutters, like the kind you get when your eye twitches. But lately I've had a few stronger "pokes" too. Its been really fun, and reassures me that the baby is still in there! 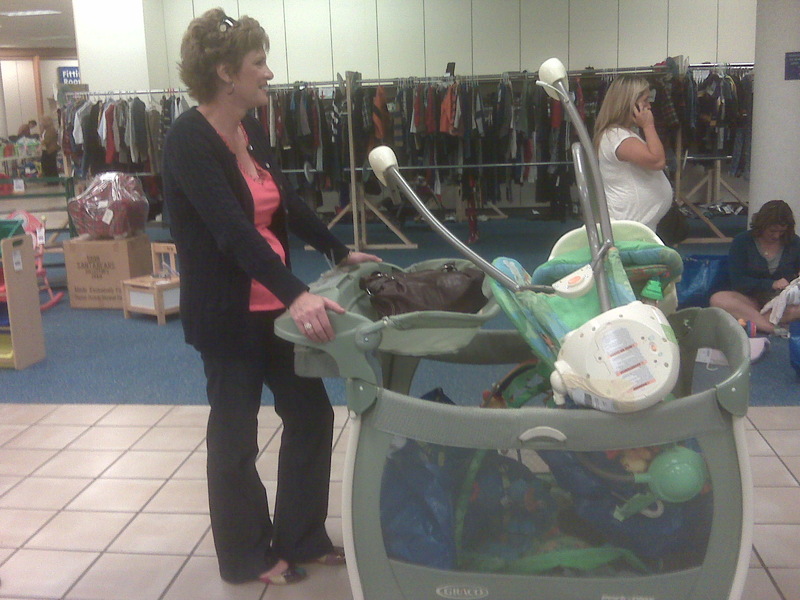 Last week, my Mom and I went to a baby consignment sale and got a bunch of stuff for the baby for super cheap. It was a little earlier than I would have liked to but the sale is only offered twice a year, and the next one is in April, so it was now or wait till after the baby is born. I ended up getting a swing, bouncer seat, playmat, a baby Bjorn and some clothes for me. My mom bought a nice pack-and-play! It was great. I'm really looking forward to the next couple of weeks. We have our next regular doctor's appointment next week. So we should hear the heartbeat again. Then in a couple weeks we will have our next ultrasound! At this ultrasound we will make sure the baby is growing and developing correctly and hopefully be able to see if its a boy or a girl!! I cannot wait for it! All our stuff at the consignment event! My mom used the pack-and-play like a cart, thankfully it had wheels or else we would have been in real trouble.